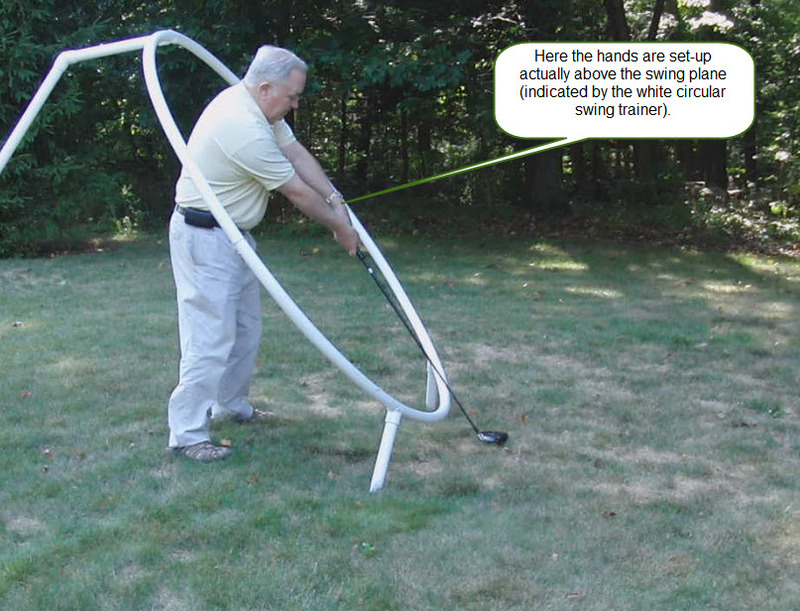 Most golf professionals teach you to set up with your hands below the swing plane (see Picture #2). That position guarantees a more complicated swing and a higher failure rate unless you have exceptional coordination and timing. .
You should set up with your hand on-plane, actually in the position they will be in at impact. If you don’t start with your hands and the club shaft being on-plane then your chance of making an on-plane backswing are zero. Your backswing will NOT be on-plane. In order to make an on-plane downswing you will have to make a complex rerouting of the club on the downswing. Think of Jim Furyk’s swing. That’s complex looping move is fine for the pros who practice 6 hours every day but for the average golfers it dooms you to failure. Go ahead and ask your PGA pro why they teach setting up with your arms hanging down so your hands are below the swing plane. The only answer you’re likely to get it because “That’s the way it done.” or “That’s the way I do it and I’m a good player.” The fact is that’s the way they were taught so that’s the way there’s going to teach it even if it makes the golf swing much harder for you. The fact is that it’s much easier especially for the average golfer to start their backswing with their hands and the club shaft on-plane. Then they can just turn their core (shoulders, chest & abdomen) and the club comes back right on plane. Since their backswing is on-plane then it’s much easier to to make sure their downswing is on-plane also since all you have to do is retrace the path the club just came up on. When your backswing and downswing is on-plane that’s called a “Single Plane Swing”. 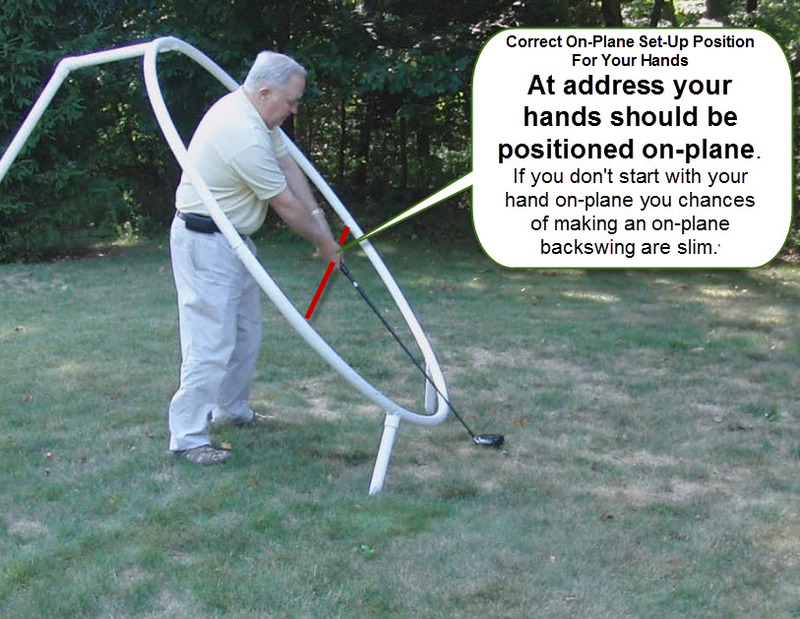 A “Single Plane Swing” is much less complex and much easier to learn than any other swing. 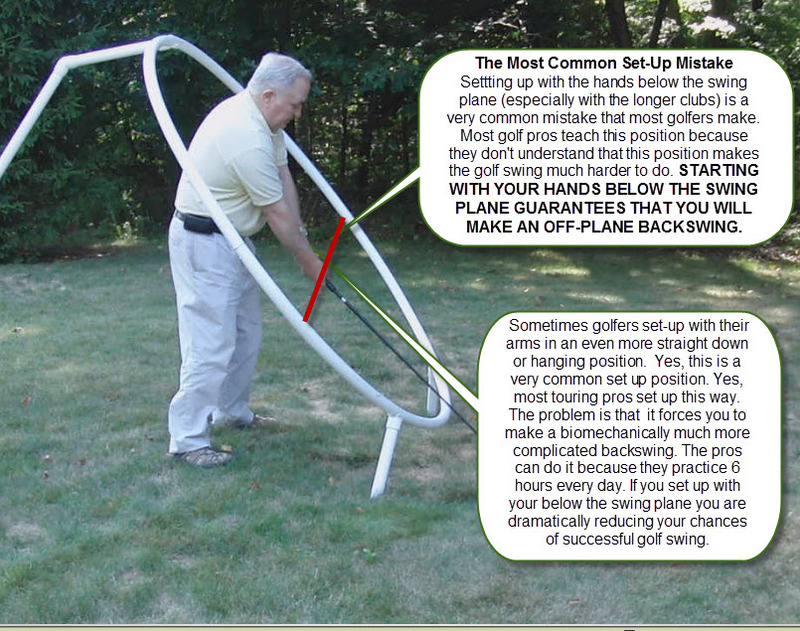 That’s why the “Single Plane Swing” is growing in popularity so quickly. 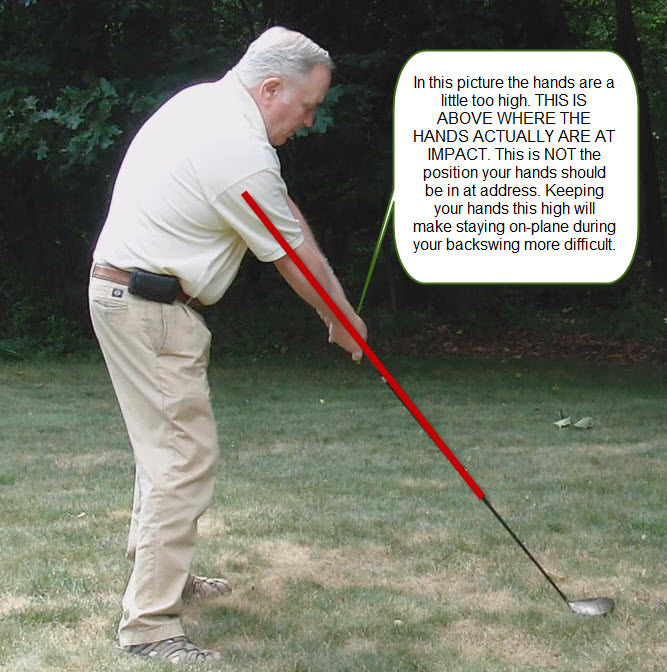 Note: If any golf professional or anyone else thinks they have a bio-mechanically sound reason to start with your hands below the swing plane please feel free to leave a comment below. You shouldn’t set up with your hands above the swing plane either. Some Natural Golfers do set up this way. That’s not the position you’ll be in at impact so that is not the position you should start your backswing. If you do start you backswing with your hands above the swing plane, again you’re adding needless complexity to your golf swing. What Is The Correct Hand Position At Address? There are two ways to address the ball and start your backswing. The Right Way 1. Start with your hands on the swing plane or in the impact position. This the the way we recommend. Biochemically it is much easier to make an on-plane backswing and downswing if you start with your hands on-plane. The Wrong Way 2. Start with your hands below or above the swing plane. Most golf pros teach your hand position at address should be below the swing plane. They say let the arms hang down almost straight which puts the hands quite a bit below the swing plane . The question is why do they say this? Go ahead as ask your local pro why they say to let you arms hand down so your hands start off below the swing plane. The won’t be able to give you a rational answer. They’ll likely give you an answer like, “Because that’s the way it’s done.” If you ask them “Isn’t it harder to make a backswing and downswing that on-plane if you deliberately start with your hands off-plane?” The likely answer will be stuttering or a blank stare. Starting with your hands below the swing means you’ll have an off-plane backswing that you’ll somehow have to reroute on the downswing making the swing much more complex. Are Special Clubs Needed for Simple Swing? Simple Swing does NOT need special clubs. If your clubs were properly fit to you they’ll work fine with Simple Swing. Some people say that swings that hold their hands higher need more upright clubs. Well that’s pure BS. The companies that say this say it to sell golf clubs. I was a Natural Golf certified instructor and I asked everyone I could find including all the people who should have known, for the technical reason to use a more upright club and none of them could come up anything close to a rational answer. Most of them just stuttered and stammered when asked. Yes, Single Axis swings and Simple Swing do hold the hands higher at address. However, at impact all arms are are extended at the same angle (i.e. on the swing plane ). The swing plane goes from the front shoulder joint to the ball to the target. Unless someone’s stance is exceptionally high or low so the shoulder joint’s height changes then the angle of the club and the lie angle are going to be exactly the same. Look at pictures of Single Axis, conventional swing and Simple Swing at impact. Except for some minor hand position differences (maybe some hip rotation differences too) at impact you can’t really tell the difference between most of the swingers at impact. That means the hand position at address at address will be the same. Bottom line: The lie angle of your clubs don’t make any difference at set-up. The only time your lie angle comes into effect is at impact. Simple Swing hold our hands higher at set-up because we are presetting our hands in the position that they will be in at impact position. Everybody’s hands are in the same position at impact. The fact is with the single plane swing gaining rapidly in popularity golfers of all levels are starting to learn how to simplify their swings. More and more pros are using a Single Plane Swing these days. To to a true Single Plane Swing you must start with your hands in impact position (meaning on-plane). Just starting with your hands on-plane biochemically makes doing a an on-plane backswing and downswing much, much easier. You can let your hands hang down below the plane but then it will take much more timing and coordination to insure your on-plane at impact. You can do it but you will be much less consistent if you start with your hands below the plane. 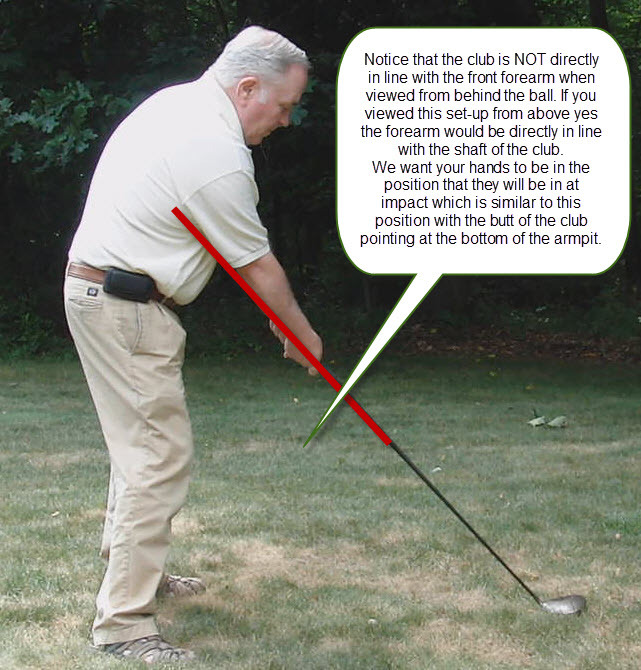 Note that when you have the correct golf hand position at address the club is soled correctly. That mean the bottom of the club sits flat on the ground the way the club manufacturer designed the club to sit. The bottom line is that your hand position at address should be on-plane and stay on-plane throughout your Simple Swing making it a true Single Plane Swing.